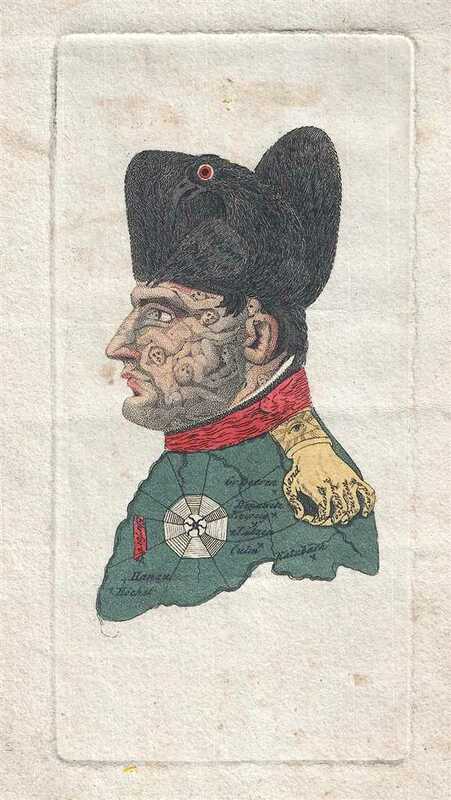 Dutch version of the most popular caricature of Napoleon Bonaparte - denouncing his villiany! Does not release its grasp of the head which it destines to fall. With which the monster fed itself generously. With the loss of battles his pride never bargained for. The dissolved Rhine Confederation threw over the reign of terror. Covers in a ridiculous manner the whole Rhenish alliance. Spread over the world, taunts God no longer. The Spider occupies the place of the absent heart. This political cartoon was printed and sold by Evert Maaskamp of 1 Dam en Kalverstraat, Amsterdam in 1814. Evert Maaskamp (1769 - January 31, 1834) was a Dutch publisher and book and print merchant in Amsterdam from about 1800 to 1834. In addition to geographical publications and topographic maps and prints, he produced fantastically illustrated works on sheet metal. Over the course of his career, Maaskamp collaborated with Charles Howard Hodges, an English artist, whose influence is apparent in many of Maaskamp’s prints. Johann Michael Voltz (October 16, 1784 - April 17, 1858) was a German painter, graphic artist, and political cartoonist. Voltz apprenticed with the engraver and art dealer Friedrich Weber in Augsburg. He focused on battle scenes and other contemporary historical images. These include events of the Napoleonic wars, the wars of German War of Liberation against Napoleon, and the Greek War of Independence. Voltz was also known as a prominent German political cartoonist. His cartoons directed at Napoleon Bonaparte are still reproduced in history textbooks. His œuvre includes about 5,000 drawings and etchings. Very good. Blank on verso. Accompanied by two Dutch broadsides in which the print is described in verse.